Christopher (Chris) Nathan Sorrells was born March 1, 1975 to Tim and Deby Sorrells in Russellville, AR. He passed away February 24th, in Russellville AR at his home. He graduated from Russellville High school in 1993. He attended First Assembly of God in Russellville. 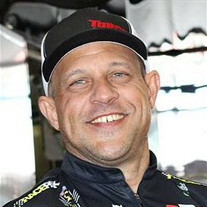 Chris (Katfish) was a former Supercharger mechanic at John Force Racing, and former Cylinder head specialist at Tony Pedregon Racing, and Scott Palmer racing. He also built his own dirt track car (#51) that he enjoyed racing at local tracks. Chris was an avid race car enthusiast, and was loved by everyone who knew him. As much as he loved racing, he loved his children the most. Rylan and Aubree were his ultimate love. He loved them more than anything on this earth and he left us too soon. He is survived by the mother of his children, Roseann Beibers, Jaden Stubblefield, Rylan and Aubree Sorrells; his brother Heath Sorrells (Melanie), his mother Deby McMahan (Jim), and beloved grandmother Betty Price. He was the nephew of Kelley Dupler (Vi), Tim Dupler, Carla Betsill (Randy), Sam Sorrells (Earline), Cindy Jones (Owen), Lisa Easton (Dewayne) and many cousins other relatives and friends. He was preceded in death by his dad Tim Sorrells and grandparents Bob and Wanda Sorrells, and Carl Dupler. We will carry you in our hearts til we see you again. Please join us to celebrate his life at First Assembly of God on Saturday March 3rd at 10:00 am.